Winemaker Giorgio Lavagna will face a new but familiar set of challenges making the famed Barolos of Bruno Giacosa. Giorgio Lavagna, 46, is no stranger to the Nebbiolo-based Barolo and Barbaresco wines of Italy's Piedmont region. A native of Turin, Italy, he studied enology at the University of Umberto, from which he graduated in 1983. 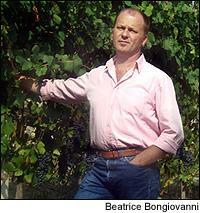 Lavagna then joined Batasiolo in La Morra, and for the next 23 years worked as head winemaker. In 1985, he produced his first vintage of Barolos and Barbarescos there, as well as other Piedmont wines such as Moscato, Dolcetto and Barbera. This past April, Lavagna moved on to a new position as winemaker at Bruno Giacosa, whose single-vineyard Barolos and Barbarescos are among Piedmont's most collectible wines. In his new role, Lavagna is in familiar territory, overseeing the 2008 harvest and producing a full range of Piedmont wines under the guidance of legend Bruno Giacosa, who has been making wine in the region for 60-plus years. Lavagna took some time from harvesting to discuss the 2008 vintage and continuing the legacy of outstanding- and classic-rated wines at Bruno Giacosa. Giorgio Lavagna: My first encounter with the wine world was as a boy growing up in Turin, helping my grandparents with the grape harvest and the winemaking process with a small part of the grapes collected to make wine for the family. My family roots are in farming, and a father in love with good wines helped create a keen interest in this world. WS: Who were some of your influences in the wine industry starting out and now? GL: The person who has influenced me most professionally … one from whom I have learnt the most, is winemaker Giorgio Grai [enologist and winemaker in Italy's Alto Adige region]. Today, I have the fortune to work with Bruno Giacosa. He has huge winemaking experience, and he's happy to share professional and human experiences that have helped take his business to the top in this global wine market. WS: Tell us about some of the other wineries where you worked and how this one is different? GL: I have been an enologist for more than 20 years. I worked in a winery in La Morra for many years, and since March, I have been working with Bruno Giacosa. Each winery in the Langhe area is different, but they all strive to produce wines which respect the traditions of the territory. There are some small companies with low to medium production levels that aim to improve the quality of the final product, like Giacosa. I'm certain that here I'll be able to express my passion. WS: What is it about Piedmont that you like? GL: The Piedmont region has a variety of landscapes, from the plains in Novara and Vercelli to the hills of Asti and Monferrato and also the steeper and more dramatic hills in the Langhe and Roero. This variety supplies a [diversity] of climates and microclimates that contribute to the production of that heritage that has become famous throughout the world. WS: What have been some of the challenges of this year's harvest, and how does this year's harvest compare to those in the past? GL: [We had] a good spring and summer rainfall. The grapes lacked some characteristic warmth and light in the months of July and August, but the optimal climate in September helped the Barbera and the Nebbiolo to recover from the delay of maturation manifested in August. On the whole, it was enough of a regular vintage year and therefore much different from 2007, where there was no winter. The wines of 2008 such as Arneis and Dolcetto seem to have a premature maturation, but have a good aromatic quality and good color—for red ones—with moderate, alcoholic gradations, compared to the fresh scents of 2007. In the mouth, there's a slightly more acidic feeling and less warmth. Barbera and Nebbiolo, which has approximately a week left for harvest, have the same fresh feeling of acidity, good color and alcohol similar to other vintage years like 2004 or 2005, but inferior to the 2007 vintage year. WS: What is your favorite food pairing with a Giacosa Barolo or Barbaresco? GL: Without a doubt, the best accompaniments to Barolo and Barbaresco are meat dishes and medium-matured cheeses. Avoid perfumes and flavors that are too strong to create a perfect match since the wines have a delicate balance and aromas. GL: I love all wines that portray the vine … where elegance and harmony are the main characteristics, like the Italian wines and the grand reds of Burgundy.